Larry Lives! Update: Oceana Takes Larry off the Menu. There was an unexpected story that ran on us today regarding a larger than normal lobster that was delivered to Oceana this past Monday. This was the first time we had a jumbo lobster of this size and did not expect it to be controversial. Larger than 5# lobsters are not uncommon in restaurants in the metropolitan area. We have been accused of turning this into a publicity stunt and of being irresponsible. The last thing we want to do at Oceana is offend anyone so we have taken it off the menu and are looking into the best way to release it back into it's natural habitat. We appreciate you taking the time to write us and hope we will see you at Oceana one day. Thank you for sharing your post with us. Lobster Tale. There are so many disturbing and thought-provoking points about this story written by Ryan Sutton of Bloomberg, and re-posted on NYMag's Grub Street. It's the tale of Larry the lobster. 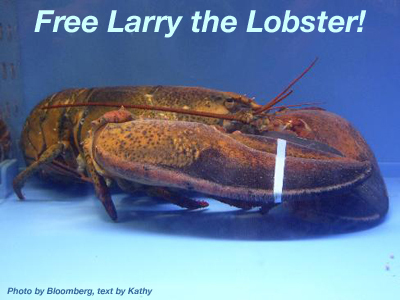 Larry is 70 years old and sitting at the bottom of a murky blue lobster tank inside Oceana restaurant in NYC's Rockefeller Center. His 70 year-old claws are bound tightly with bands. For only $275 you can have Larry killed, poached and served with a rich sauce made from his liver. Sounds grotesque to any animal lover, I know, but that is the reality. The interesting part about this story is that because of Larry's age, he has suddenly been turned from 'dinner' into a 'living creature' worth giving a bit of analysis about his lobster life. Seventy years old is older than most humans. Why Larry? As a vegan and animal lover, this story boggles my mind. I don't get it. How can you go from one day dining without thought on any creature of land or sea to suddenly halting, pausing, and feeling a bit unsure about what's on your dinner plate? I'd love to hear what others (vegan or not) think about this lobster tale. Food for Thought. A cow escapes a slaughter factory, and suddenly its face is given a soul and it is freed to a local no-kill farm. A chicken becomes the best friend of the 'farmers daughter' and suddenly he doesn't have the heart to kill it. Or a lobster lives past the age of 70 and there is suddenly a bit of merit given to its lobster life. A question for the carnivores: do you feel odd eating something that's lived longer than you? We hear these stories all the time and they always make me pause. Why does one animal have a soul that's deserves a long life and another animal or the same species is simply thrown away? I don't want to preach or ramble, I think you get my point. And I think you can do your own analysis on this story. But in closing, I truly do hope that they (Oceana's management staff) let Larry live - or someone even buys Larry his life back. But then again, if I had a billion dollars, I'd buy all the bound and tagged lobsters (of any size or age) sitting in lonely restaurant tanks and set them free to a deep sea ocean to swim and glow and live out their long happy lobster lives. GrubStreet reports, "Ryan Sutton of Bloomberg has found a specimen of a similarly impressive age (it’s over 70 years old) at Oceana, where it can be poached, steamed, and served in a sauce of lobster liver and roe for $275. A manager assures Sutton that Larry (as the critic has named him) will get his “just due” and that he “will be enjoyed,” should someone splurge for him, but that doesn’t stop Sutton from confessing: “There’s something deeply unsettling — logic and science aside — about feasting on a creature so long-lived. Surviving to such an age, having dodged lobster traps all his life, doesn’t he deserve some sort of ‘get out of jail free’ card?”"
Read the full GrubStreet blogpost here. Contact Form to email the Oceana Staff to Save Larry! "Phoebe: Hang in there. It's gonna happen! Ross: Okay, now, how do you know that? Phoebe: Because she's your lobster! Chandler: Oh, she's going somewhere. Phoebe: Come on, you guys, it's a known fact that lobsters fall in love and mate for life. You know what, you can actually see old lobster couples walking around their tank, you know, holding claws…"